JILL & Payless Furniture & Appliances has your chance to win free concert tickets! Just text the word CONCERT to 64600 for your chance to win free concert tickets in May, June or July! Message & data rates apply, please no texting & driving, 1 entry per mobile number per week. When you text to win, you will be placed in a database that will enter you to win tickets to any of the 3 giveaways in May, June & July. When you enter, you are agreeing to receive up to 10 text messages per month, including offers from the sponsor business (Payless Furniture & Appliances). If you unsubscribe from texts during the contest period, you will no longer be eligible to win. Coupons/offers sent out from sponsors may vary, and are NOT valid for concert tickets; they are simply a money saving coupon or message about a deal from the sponsor. Winners will be notified via text message at 10am on the date each months contest ends. The winning text message will request that you call to confirm your prize. If the prize has not been confirmed by 2pm on the day we send the winning message, the prize is considered forfeited, and a new winner will be chosen. There is only 1 winner per concert. Prizes may be actual paper tickets or virtual tickets, depending on the event. You will need a Ticketmaster account in order to collect some prizes. Registering for a Ticketmaster account is free, through their website. Certain concerts may not have paper tickets and will require us to transfer the tickets from our Ticketmaster account to yours. You will need to show your tickets on your mobile device at the venue to obtain entry. 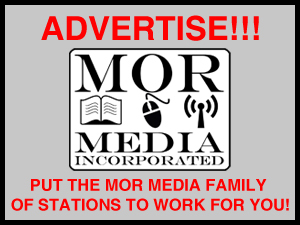 MOR Media is not responsible for tickets once they have been transferred to your account. Please visit the venue website for information on parking and venue rules/regulations. Employees and immediate family members of MOR Media, other media companies, and any sponsors are not eligible to enter/win. Please refer to our general contest rules for any other rules/restrictions.